Tag line: "Courage Conquerors All"
I’m a proud fan of ‘80s fantasy / adventures (Conan the Barbarian, Dragonslayer, Clash of the Titans, Time Bandits), even the silly ones (like Krull and The Sword and the Sorcerer), and I always have a great time whenever I watch these movies. Kull the Conqueror, however, is a ‘90s fantasy / adventure, and isn't as entertaining as its ‘80s counterparts. After defeating Borna (Sven-Ole Thorsen), the near-crazed King of Acheron, in a battle to the death, the barbarian Kull (Kevin Sorbo) inherits the King’s crown, and becomes the new ruler of the land. Naturally, this doesn’t sit well with the rightful heirs, including the warrior prince Taligero (Thomas Ian Griffith), who plots openly to dispose of Kull as soon as possible. To this end, Taligero seeks the help of Enaros (Edward Tudor Pool), a wizard whose mastery of ancient magic allows him to raise a 2,000-year-old demon witch named Akivasha (Tia Carrere) from the dead, in the hopes she will destroy Kull once and for all. Though he has developed feelings for palace slave / soothsayer Zareta (Karina Lombard), Kull nonetheless falls under Akivasha’s spell, and after a hastily-arranged wedding ceremony he declares her his queen. Does the mighty Kull possess the strength to eventually resist the evil Akivasha, or will she use her powers to transform Acheron into a hell on earth? One of the many issues I had with Kull the Conqueror was its hard rock soundtrack; though not prevalent throughout the entire movie, it doesn’t quite fit the scenes in which it is employed (like the opening sequence, when Kull is trying to prove he’s worthy of joining Taligaro’s honor guard). 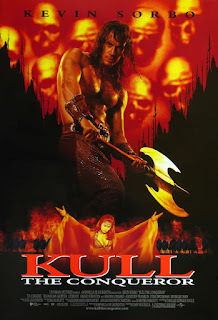 With its lackluster costumes, bland set pieces, and shoddy special FX, Kull the Conqueror also has a made-for-TV feel about it, a la Hercules: The Legendary Journeys (starring Kevin Sorbo) or Xena: Princess Warrior, both of which were popular shows at the time this film was produced. In addition, the world created for Kull the Conqueror isn’t all that impressive. Nor, for that matter, is it’s mythology; Enaros conjures up Akivasha far too easily, and she, in turn, wins Kull’s affections moments after the two first meet. As a result, the movie’s more fantastical scenes have no real weight to them. The cast does a decent job. while he doesn’t have the screen presence of Schwarzenegger or Stallone, Kevin Sorbo fits the part of Kull well enough, and isn’t the worst lead actor I’ve ever seen. As for the chief baddie, Tia Carrere delivers a spirited performance as Akivasha, the demon who becomes a Queen. Unfortunately, none of the film’s characters (including these two) are as defined as they could have been, giving us zero reason to care about a single one of them. I'm a huge fan of The Beastmaster, The Sword and the Sorcerer, Dragonslayer, the Conan movies, and other movies of that ilk from the 80's, but they all had something that Kull the Conqueror lacks... and to be fair, I'm not 100% sure what that is... maybe it's a kind of innocence that movies in the 80's had... maybe it's sheer entertainment value... because I, for one, have more fun watching this type of movie if it's made in the 80's, as opposed to newer ones... Does that make sense? As always... great review, my friend!